Just wanted to share how I just got my iPhone 5 for FREE! First, to do this, you must be eligible for an upgrade. I checked with AT&T and though my 2 year contract wasn’t up until December, I was told that I was eligible at the 20 month mark on my account. You would have to verify your own contract with either AT&T or Verizon. If you upgrade, there will be a requirement of renewing your contract for 2 years. Oh, and to save yourself a trip back to the store, back up your phone before you go! I did my upgrade at Target. First and foremost, the upgrade price of the iPhone 5 is $99 right now! The second reason is because I accidentally discovered their TRADE-IN program! I had no idea. They don’t only take iPhone trade-ins either! I was just leisurely looking around the electronics department last week and the woman working there struck up a conversation with me, and told me about this great program. I mentioned that my husband got his upgrade elsewhere a few weeks prior, but didn’t even consider trading in because his iPhone 4S had shattered glass. She said that she has seen shattered phones get between $35-$75 in trade in value. The trade-in values vary by phone. My phone wasn’t backed up so I had to come back. A few days later, I showed up at Target with my iPhone 4S and my husbands shattered 4S, that was held together with clear shipping tape! They entered the serial numbers on their upgrade system to get the values. Are you ready for this?! My 4S fetched $180! His cracked phone fetched $108!!!!! 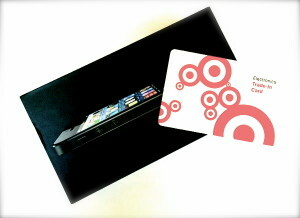 I was given a Target gift card of $288.00! We reset both phones to remove our personal data and I purchased my iPhone 5! It was $99.00. The only catch, is the tax! My total was $155.99, which consisted of the iPhone, Ca Mobile Tax and Sales Tax. I left the store with my new iPhone 5 and $132.01 remaining on a Target Gift Card!